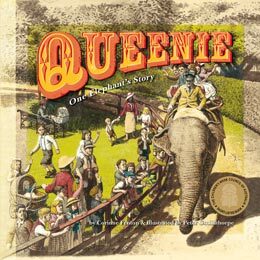 Yesterday a dear friend alerted me to a Facebook post about Queenie the elephant, so I decided I’d write this week’s blog about her and about the book Queenie One Elephant’s Story which was released in hardback in 2006, in paperback in 2012 and a US version in 2013. There always seem to be questions about Queenie, even all these years on from the book release and probably the best way I can answer the continued questions about her is to suggest you borrow or buy the book (paperback still definitely available). And the best way for me to give you the background is to cut and paste my launch speech below, delivered at the Melbourne Zoo on 22 January 2012. I would like to thank The Hon. Ryan Smith for launching Queenie: One Elephant’s Story today, Zoo Director Kevin Tanner for allowing us to use this special place, which was Queenie’s home, everyone at Black Dog/Walker Books for helping me share Queenie’s story, especially Maryann Ballantyne and Andrew Kelly and Karen Tayleur for putting up with me and Queenie, Anne Black for always being there from the beginning, the Greensborough Cake Decorating Centre for this magnificent cake – a replica of the illustration in the book of Queenie’s birthday cake made in 1940, to Peter Goulthorpe for his beautiful illustrations, to my family and friends (for also putting up with me – my conversation lately has been limited to books and elephants) and to you all for being here today. At the launch of the hardcover of Queenie 5 years ago, I said the reason I wrote her story was to introduce her to a new generation, so she would never be forgotten. I believe she earned that right. Queenie carried up to 12 passengers at a time, up to 500 a day and she walked the circuit here giving rides for almost 40 years, walking over 100,000 miles and carrying well over a million passengers. Over the last 5 years I’ve introduced Queenie to children at schools, libraries, writer’s festivals and bookshop signings and watched as they tug their parents sleeves and say ‘There’s Queenie’. Queenie the book has proven that picture books are not only for children but can be enjoyed by seniors and all ages in between. I am now very lucky to have a precious collection of letters and drawings from children – the drawings from girls often show Queenie with a pink bow and always with very long eyelashes and the letters are always thoughtful and heartfelt. There was another young girl, who at 11 or 12 years old, used to walk from South Melbourne into the zoo to have a ride on Queenie every Saturday afternoon. In later years she and her husband-to-be would also visited Queenie when they were “courting’. Over the years she told the story to her children and grandchildren. When the book came out, her grandchildren read it to her over and over and they believed that one of the little girls in the illustrations was their grandmother. In my letter-box one day I received a stunning photo of two toddlers in an old-fashioned pram – and Queenie, her trunk is also in the pram. In 1902 Frederick Shepherd Grimwade who was then the president of the Zoological & Acclimatisation Society of Victoria donated the cost of Queenie to the zoo and because of his gift Queenie was known as the Grimwade elephant. I think some of the Grimwade family are also here today. The lady replied, that until that moment, she had always believed Queenie had been sent back to India, because that’s what her parents told her. As a little girl of 4 ½ years, Barbara was worried that Queenie would be jealous of the new merry-go-round that had just been installed. At a bookshop another day I met a gentleman clutching some papers. He had been the assistant pastry chef who helped decorate Queenie’s cakes from 1940 to 1944 and he’d brought with him his apprentice papers to show me. Maurice is also here with us. Maryann Ballantyne has always said that she knew the power of Queenie from the times when her mother told her Queenie’s story when she was small and Andrew’s parents met on the back of Queenie when they were 3 years old – they too are here today. So we have children around us, a new generation, but apart from their clothes and hair styles, they are not too different from those in the first half of last century; and there are many of you here who rode on Queenie’s back, but as I say in the book, I believe Queenie’s spirit is also here with us and especially close today when we celebrate the re-launch of her story. Thank you. Now we’ll cut the cake and if all you children would like to come up you can have a piece.